A local football match took on significant meaning for supporters this weekend - as war-torn Aleppo saw its first live game in five years. There has been no professional football in Aleppo since it was divided between the army and rebel forces in 2011. But the government regained complete control of the city last month in a major offensive. The grass was brown and weathered from the winter cold, and the stadium had clearly been damaged by the war's bombing campaigns - but the atmosphere was like any local football game elsewhere. The only hints of the division that plagued the city were a prominent banner in the stands showing Syrian President Bashar al-Assad and the police in riot gear standing on the sidelines. But the crowd remained upbeat, chanting to the sound of drumbeats and waving flags in their team colours. "I can't tell you how it feels to return to the pitch (in Aleppo) after five years," Ittihad player Omar Hamidi told reporters before the game. "My heart's beating so fast," he said. Hurriya player Firas Al-Ahmad said travelling to the game from the coastal city of Latakia - where his team has been playing this season - had hurt their performance. However, he said he was happy to be back home. "It is our right to play in Aleppo. And we play better in Aleppo. When we play on our ground with our fans our performance improves. "We want to make Aleppo's name high," he said. 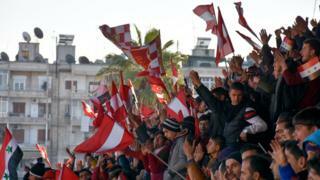 The return of football to Aleppo is likely to ease organisational problems for the football league - which has only been able to hold games in two major cities.